The Star of Honolulu® is located 15 minutes from Waikiki, at the Pier 8, Aloha Tower Marketplace, 1 Aloha Tower Drive, Honolulu Hawaii, 96813. If you are arranging your own transportation, please check in 45 minutes prior to departure at our Reservations Office, next to the Star of Honolulu. 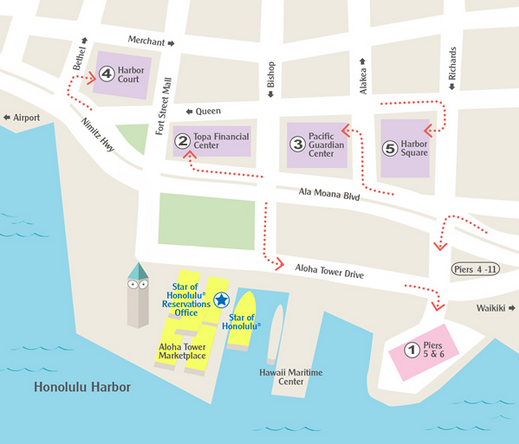 Reduced fee parking is available at the Piers 5 and 6 at the Aloha Tower Marketplace when you obtain a validation from the Star of Honolulu®. Simply present your parking ticket upon check-in to receive the validation. Additional parking may be found at nearby parking facilities below. Note: Parking facilities are not owned and operated by Star of Honolulu and subject to change without notice. *Please inquire at the parking garage for their current rate.